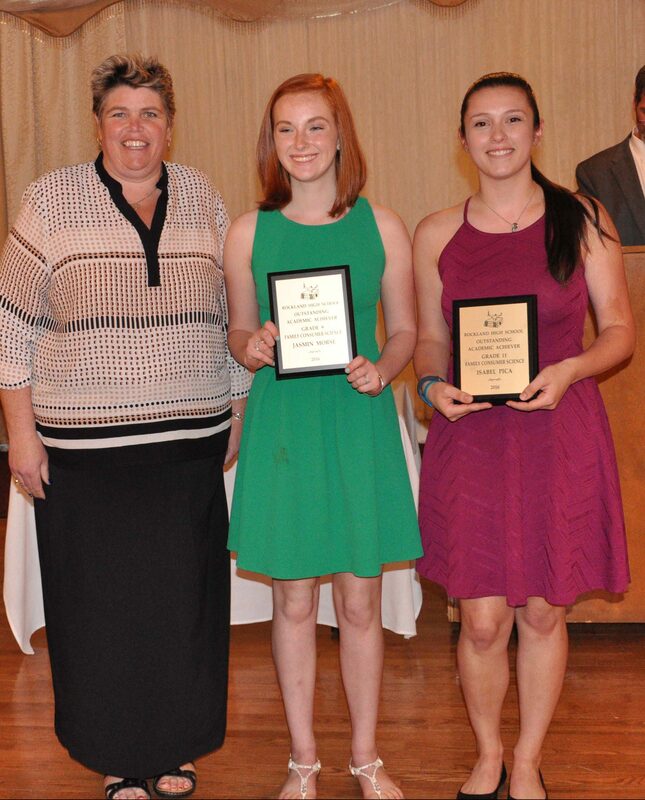 Three Rockland High School alumni were inducted into the Rockland High School Academic Hall of Fame on Wednesday, June 8 at the Emerald Hall in Abington. 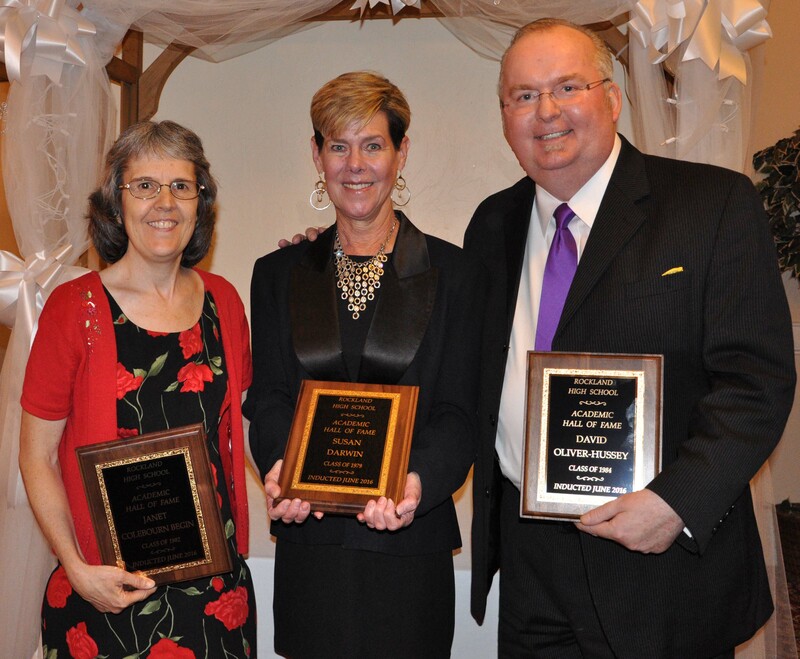 They are Susan J. Darwin from the Class of 1979, Janet Colebourn Begin from the Class of 1982 and David Oliver-Hussey of the Class of 1984. After the Hall of Fame Induction academic underclassmen awards were given out. 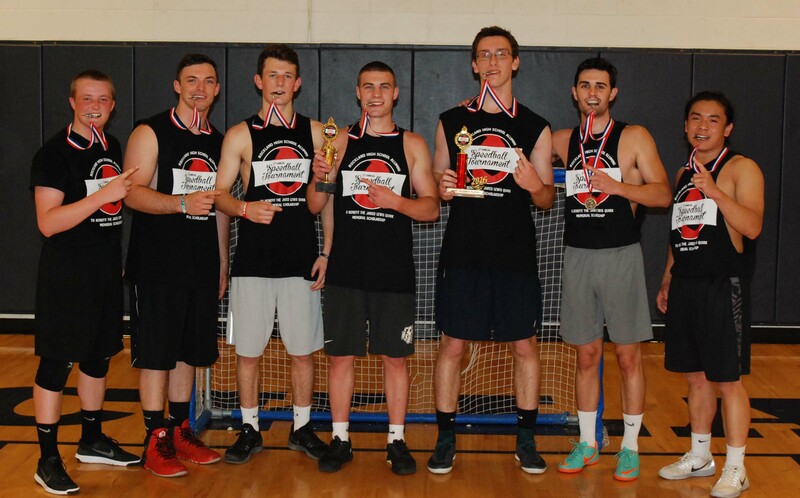 Following is a list of award winners and a photo gallery of some of the winners. 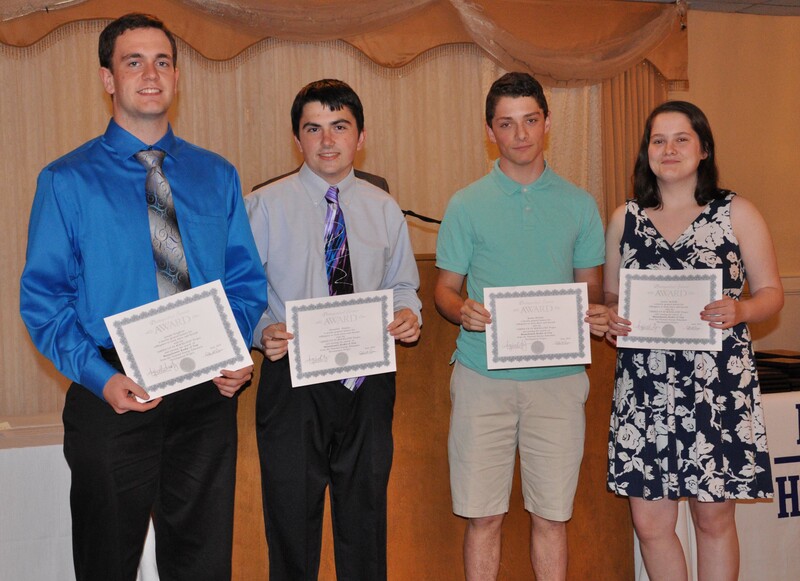 Joe Naughton, Alex Domina, Ronan McNally and Saoirse McNally received certificates recognizing their achievements with an environmental project. 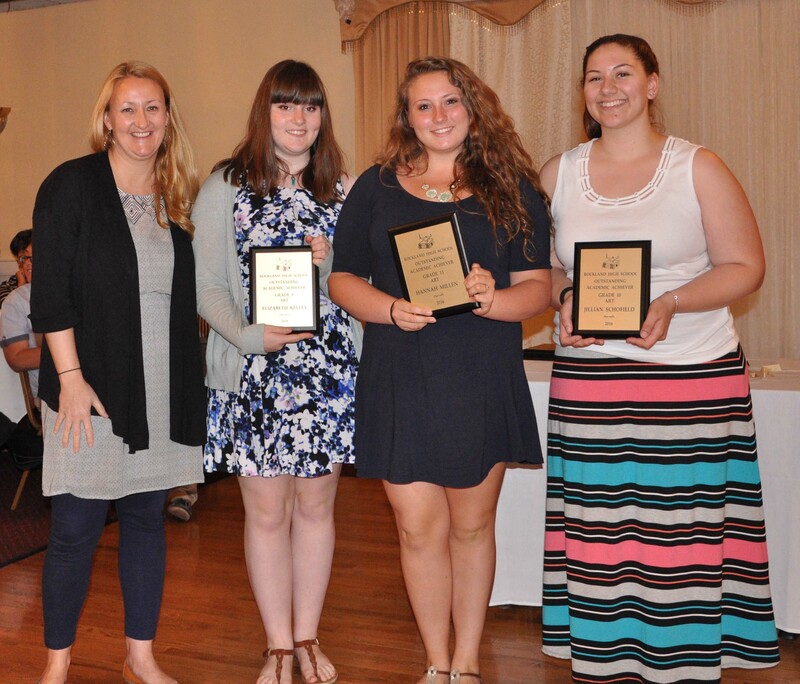 Mrs. Palmer with World Language Award winners: Tatianna Hill, Katie Houde, Sabrina Sprague and Rebecca Taylor. 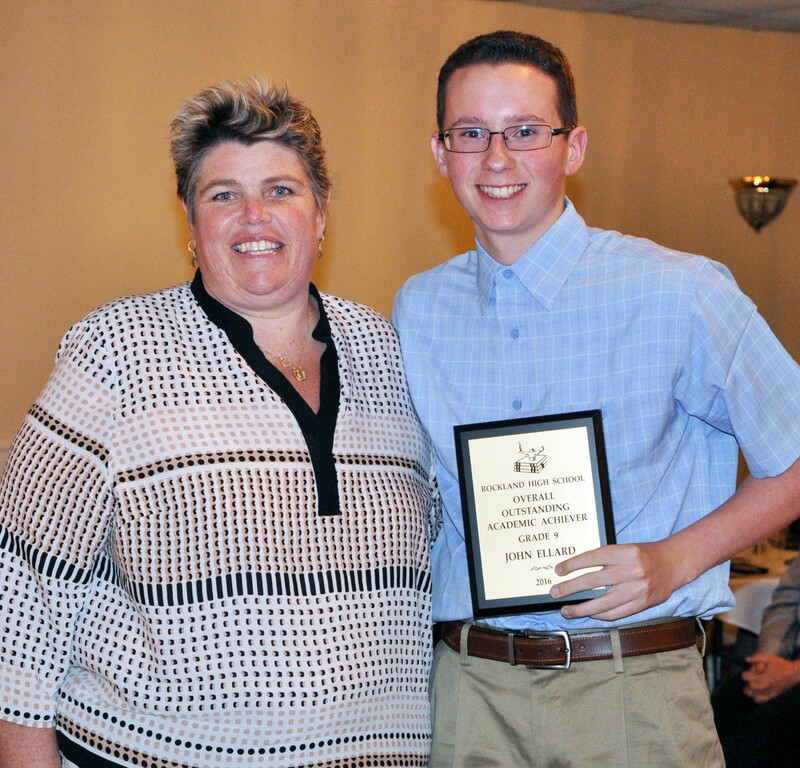 Shannon Lindahl with Ms. Paulding. Shannon was awarded for English and Science. 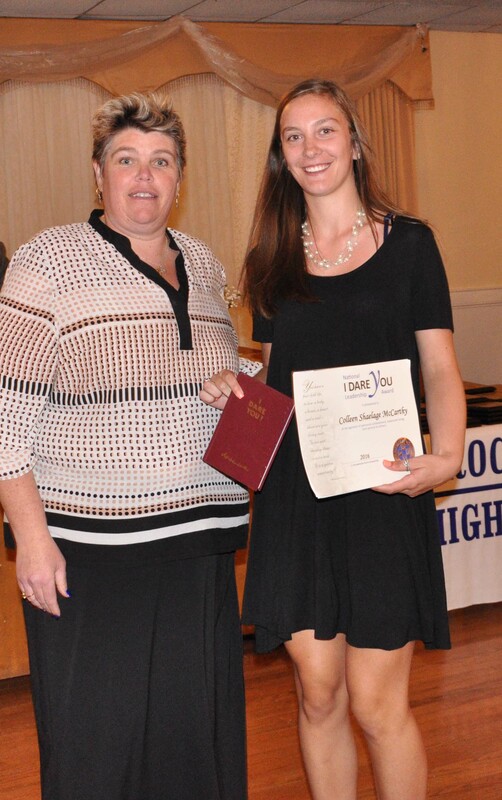 Luana Lima won St. Michael’s College Book Award for and outstanding high school junior. Meredith Long, Gr. 10, Kellie Berry Gr. 10, Francisco Oliveira, Gr. 9 and Luana Lima, Gr. 11 with Ms. Cahill, English Department Head. Class elections took place on June 8, and officers were announced. Speeches were played in history classes throughout the week and students got to vote on who will be the best representative for them. Each class has a President, Vice president, Secretary and Treasurer. The final results are below. 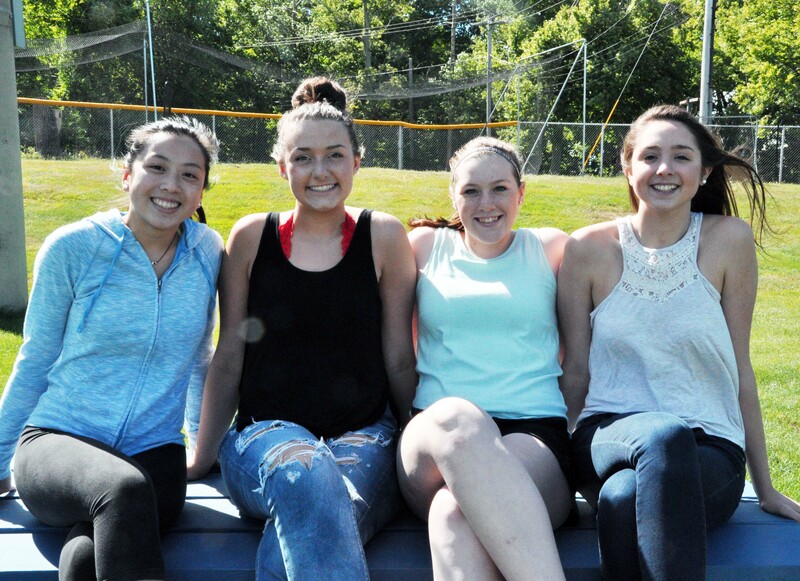 Class of 2018 Officers- Izzy Uong, Hannah Boen, Jill Donahue, Hannah Murphy photo by Michelle Downey. 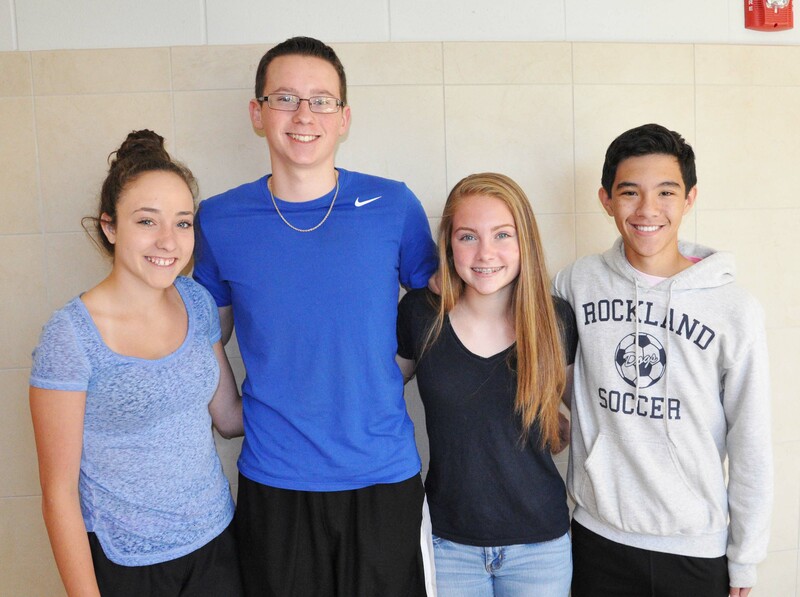 Class of 2019 Officers – Madison Blonde, John Ellard, Abby Condon, Justin Sherlock photo by Michelle Downey. 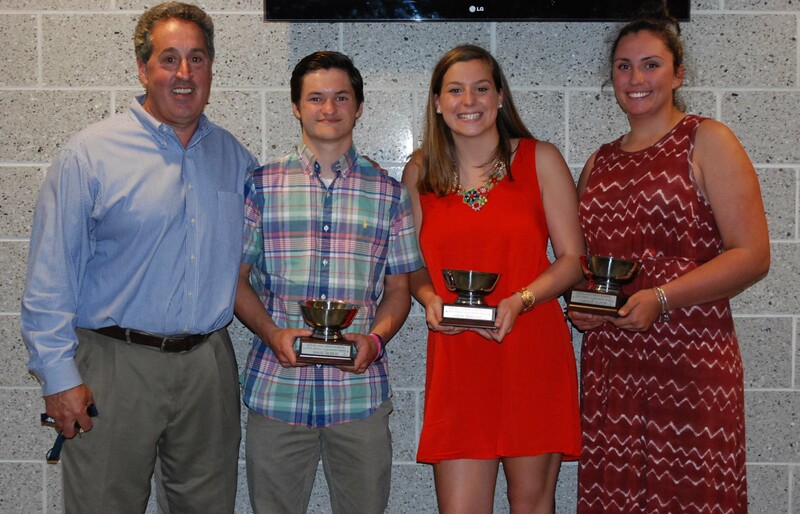 Winners of silver bowls for earning 10 or more letters in their high school careers were left to right: Shane Murray, Sarah Margolis and Caroline Kilduff. Shown here with Gary Graziano, RHS athletic director. 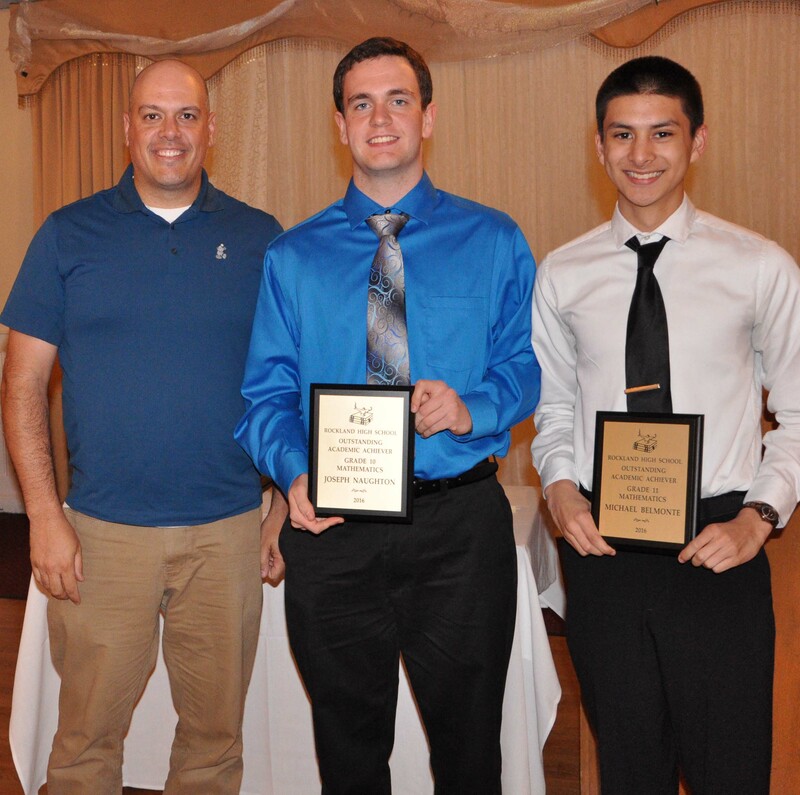 Mr. MacAllister presents Jonathan Nguyen with the WARREN NAJARIAN AWARD for the athlete who never gives up. 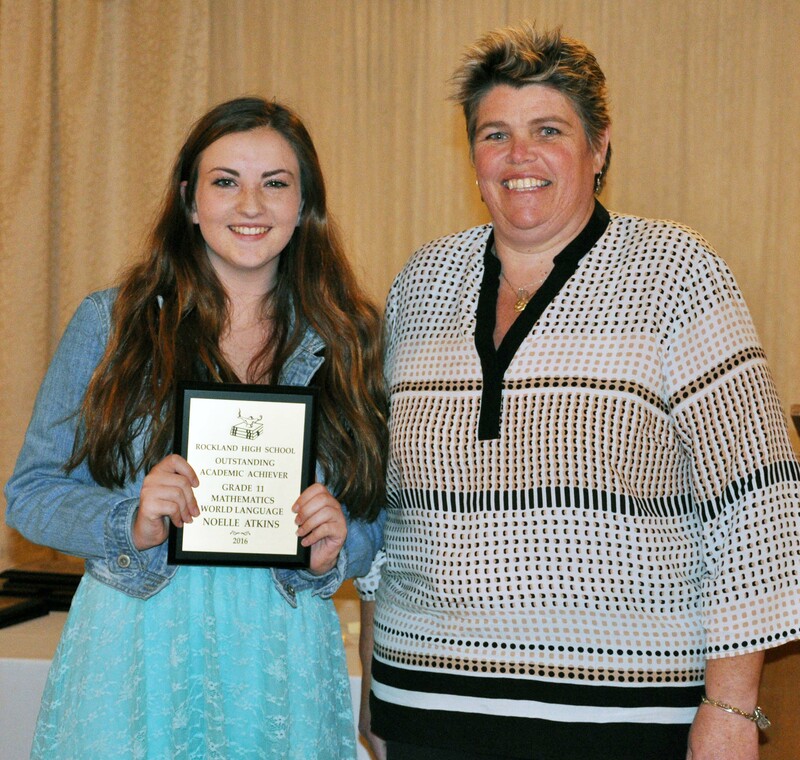 Mrs. McGonnigal presents Kylie McKenna with the JOHN DELOREY AWARD – for a female athlete that exemplifies sportsmanship. Mr. Johnson presents Samantha DeMarco with the WOMEN’S COACHES’ AWARD for a Senior Female Athlete. 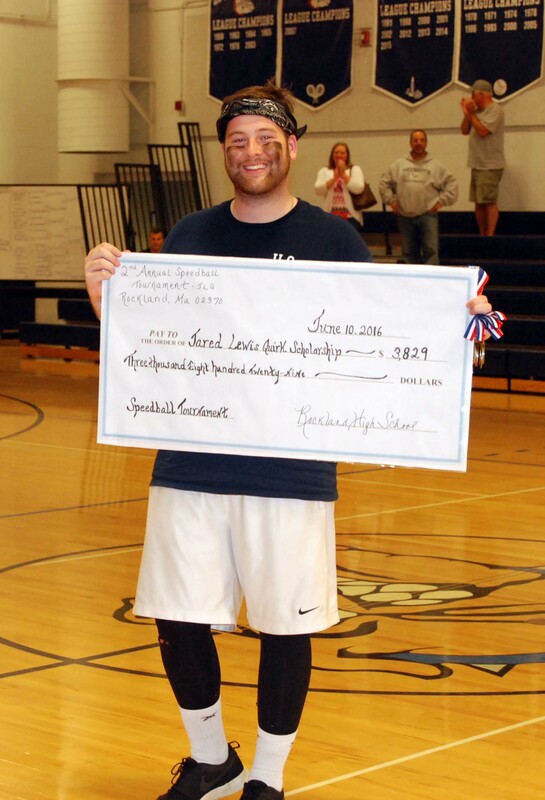 Mr. Damon presents Joe Kimball with the ROBERT ELLIS AWARD given to a top student athlete/basketball player. Mr. Damon presents Stephen Norris with the PETER J. CROWLEY AWARD. Mr. Liquori presents Harrison Shields with the JOHN BELL AWARD. Mr. Graziano presents Shane Murray with the JOHN BELL AWARD. Mr. MacAllister presents Lexie Carchedi with the JOHN BELL AWARD. The final Veritas broadcast of the year includes an interview with retiring Superintendent of Schools John Retchless, and RHS Principal Dr. Alan Cron. 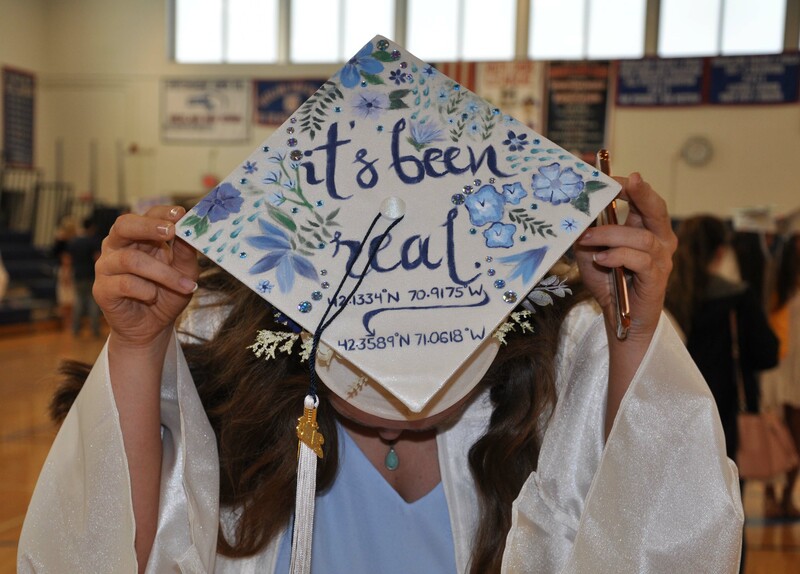 Highlights of the Class of 2016 Graduation and interviews with teachers about their summer plans are also included. This broadcast was produced by members of the Journalism class. Jill Donahue filmed the graduates’ walk through elementary schools; Molly Grass conducted the interviews with teachers about their summer plans. Sarah Boucher and Rebecca Elliott of the Digital Media class filmed graduation; Hannah Boben conducted the interview with John Retchless and Adiza Alasa served as anchor for the broadcast with Theodora Panagiotidis, Kaylee Ellis, Joe Taft, Patrick Murphy and Hope Geary in the control room. Link to Graduation in photo gallery. 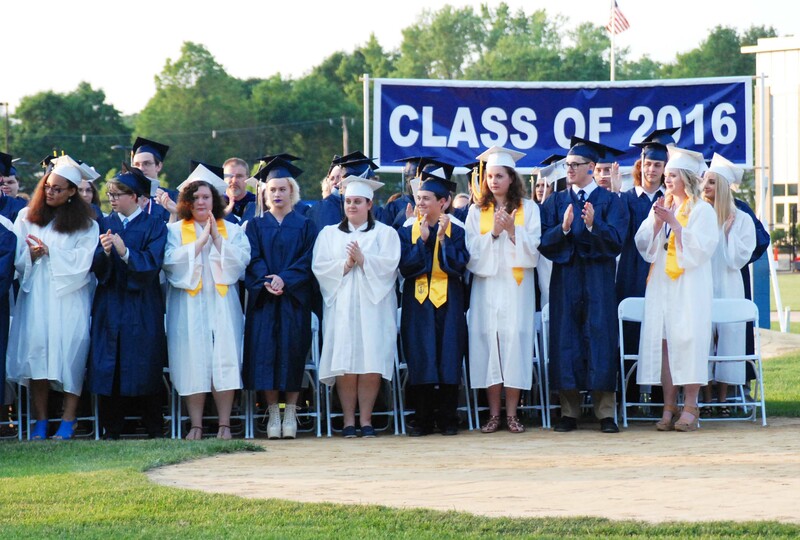 The Class of 2016 Graduation on Friday night June 3, 2016 was a bittersweet ceremony in which 129 received diplomas. Following are details about the class. Michael Ahern, Ashley Arena, Justin Arena, Trevaughn Augustine, Samantha Aylward, Erika Barstad, Sara Bistany, Lucy Boggs, Riley Bouchard, Jeremy Bradley, Mickey Burns, Joseph Callahan, Jonathan Cannon, Alexandria Carchedi, Sean Carney, Albert Clark, Samuel Collyer, Liam Connelly, Kevin Costello, Dylan Cunningham. Shane Darcy, Leah DeCecco, Samantha DeMarco, Marquis Denis, Ashley DeWolfe, Andrew Doig, Kaitlin Dorney, Shane Driscoll, Shelise Dutcher, Kaylee Ellis, Mark Ewell, Meghan Foster, Austin Gareau, Brad Gasdia, Tamara Gibson, John Glennon, Brendan Goudy, Anthony Gramazio, Lauren Grisolia, Garritt Guerrero, Alyssa Hatch, Caitlin Hedges, Ryan Hooper, Sarah Hunter, Christie Hurley, Cassidy Hyson, Lauren Illes, Michael Ivanoskos. Taia Johnson, Sarah Kane, Kylie Keefe, Caroline Kilduff, Samuel Kimari, Joseph Kimball, Brittany King, Abigail Kinlin, Matthew Kirslis, Elizabeth Knobel, John Lampert, Riley Lang, Raye LaPlante, Jr., Thomas Lavertue, Talya Lazisky, Daniel Leary, Jr., John Lenihan, Kevin Levesque, Jr., Kalee Lucier-Hill. Brian MacDonald, Haley Macray, Owen Mahoney, Gregory Makarski, Liam Maloney, Jennifer Manning, Jillian Manning, Sarah Margolis, Russell McCauley, Brianna McConville, Kylie McKenna, Thomas McKim, Jr., Hunter Morris, Jeremy Morrison, Tyler Murphy, John Murray, Shane Murray, Jonathan Nguyen, Stephen Norris, Jenna O’Connor, Jared Ochenduszko, Prisca Okonkwo, Ryan Palmer, William Parlee, Myah Parsons, Ana Paula Pedra, Ashley Pezzella, Kaleigh Pishkin, Rebeca Portela, Zachary Pransky. Carly Reardon, Gustavo Ribeiro, Mitchell Rice, Bella Rindone, Jo Roberts, Michael Rocha, Celia Rosa, Kyra Rose, Levi Sahn, Alecio Sampaio Jr, Taylor Schell, Ryan Shea, Harrison Shields, Steven Shorrock, Treasure Smith, Thomas Spengler, Alyssa Stanton, Adria Stephens, Ryan Sugrue, Timothy Sullivan, Jon Sylvester, Syann Teixeira, Kiera Tobin-Rosman, Angela Turner, Taylor Whitley, Erika Wiley, Patrick Winter, Makayla Wright, Hao Xu, John Yandle, Caitlin Yannizzi, Fanting Zhou. 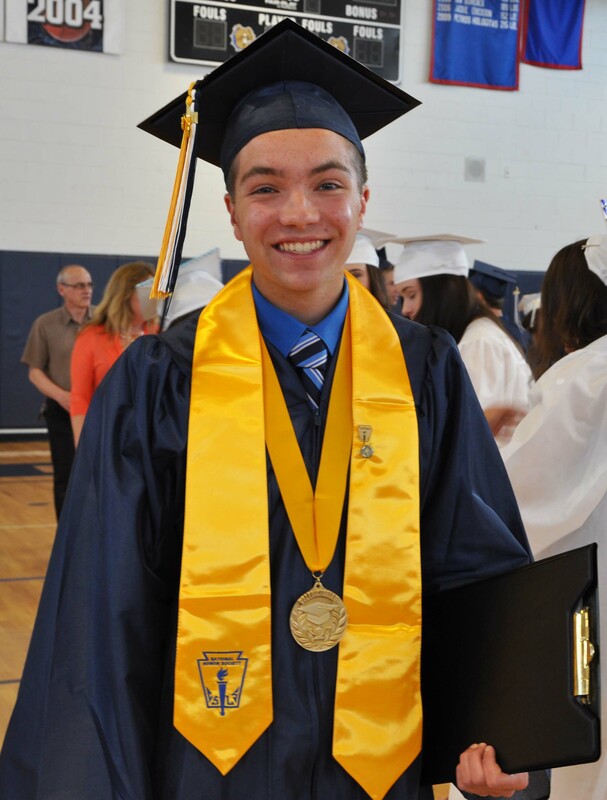 Link to Graduation in photo gallery. with more pictures to be added as we receive them! Before graduation seniors gathered in the gym to get ready for the ceremony. Some steamed their gowns, all posed for pictures, and some showed off their decorative caps. Following are photos by Hannah Boben and Michelle Downey, Veritas Photographers. First a look at some of the decorated caps. Pictures with friends, classmates, teachers and some selfies! We will be adding more to these galleries so keep checking back. Striking a pose one more time! Ms Sullivan and two of her students. 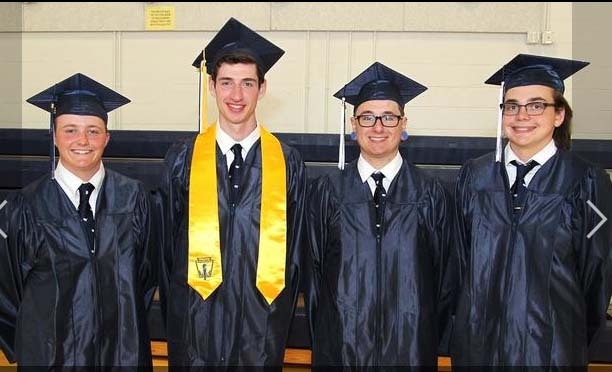 Taylor Schell, Ryan Hooper, Brian McDonald and Gustavo Ribeiro are entering the military upon graduation. Check back to see our gallery of the ceremony itself!